Blog post 350 on this blog – vive la communite! Quick blog post to celebrate a bit of a milestone and round out the month of May – no blogging tomorrow. Earlier today I was making a backup of all the content on my blog because I want to make sure I have a secure copy of it if multiple failures happen with site hoster etc. Look, come-on, this is me, I'm about the most paranoid person on the planet in terms of backups, corruption, HA, etc. Anyway, as I was doing it, I thought it would be neat to count up the number of posts since I started this blog September 1st 2007 after leaving Microsoft the day before to join Kimberly. This is blog post #350 on this blog! And as I was backing everything up in Word docs, one per month, I counted up the number of pages of 10-point font content on the blog. With the last few blogs posts, there's over 630 Word pages of content. Several book's worth. Which made me realize that I really really like writing and sharing information. So – thanks for reading, commenting, cajoling, and asking questions. Keep it up and I'll keep it up too. 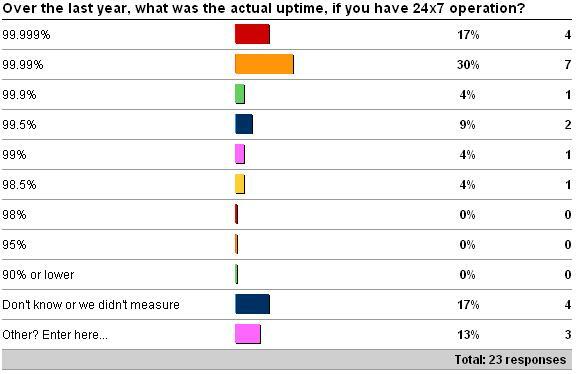 Weekly survey: what’s the most important thing when performance tuning? This week's survey is going to provide some fun debating topics. I'd like to know what the number 1 thing is that YOU go after when performance tuning – what do you think is most important? (Assuming you're not just randomly walking up to a server to do some perf tuning – there's an actual problem). There is deliberately no 'it depends' answer, no 'combination' answer, and no way to suggest something else. If what you think is most important isn't on the list, don't vote, but I'd like to hear your opinion after the editorial next week. As always, a big Thanks! for contributing to the blog by responding. Please shoot me an email (Contact button, bottom left of the blog), or ping me on Twitter (@PaulRandal) if you have an idea for a good survey. PS And again, as always, no comments on this post please (I'll delete them straight away) – please wait for the survey results post to avoid skewing the answers. I'm very interested in your reasoning, but not until everyone else responds. 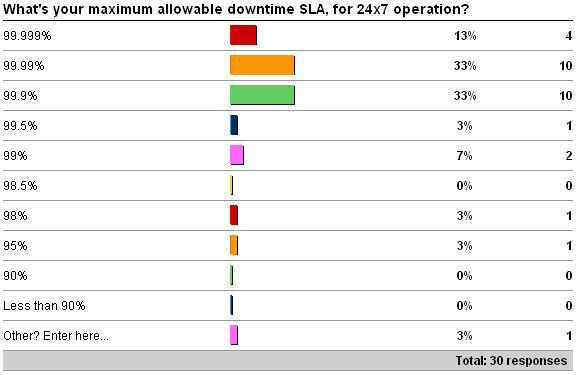 The first question was what is your maximum allowable downtime SLA (either for 24×7 operation or not). See here for the survey. Here are the results as of 5/30/09. The Other values were all about not having SLAs defined. And I think that's why this survey had a poor response rate – most of you out there don't have defined SLAs. On the other end of the spectrum, you might be thinking – wow – 99.999% target is completely unattainable for the majority of businesses out there, BUT again it totally depends on the application and business requirements. This may be attainable for a simple application and database that doesn't generate much transaction log, or for a large, very busy OLTP database that generates lots of log but the company has lots of money to throw at the HA problem and can afford redundant clusters in separate data-centers with fat, dark-fiber links between them. 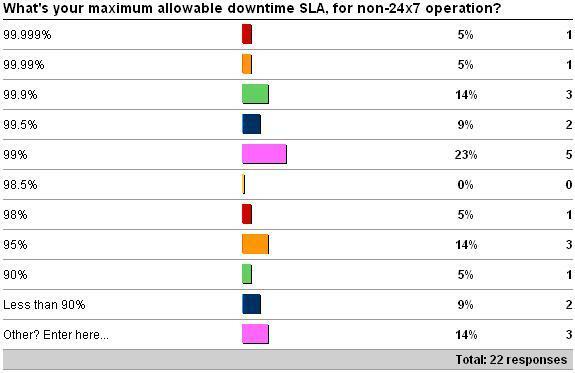 Defining SLAs, and not just for maximum allowable downtime, is incredibly important. When done properly, defining SLAs shows that the technical staff in a company and the business management in a company are in tune. It shows they have extensively analyzed the business requirements of an application and balanced them against the technical, space, power, HVAC, manpower, budgetary, and other limitations which may prevent a higher percentage being set as the target. It provides a meaningful input into the design and architecture of systems, and the choices of technologies (note the plural) required to achieve the target SLAs. It shows the company shareholders that the business managers understand the criticality of applications involved in running the business and that they are taking steps to safeguard the shareholders' equity interests. Note I said 'when done properly'. Technical staff picking SLAs without business input, or vice-versa is a recipe for disaster. If the technical staff don't understand the business requirements, how can they pick appropriate SLAs? If the business managers don't understand the technical limitations, how can they pick achievable SLAs? Everyone has to be involved. And one of the most important things to consider is whether the SLA covers 24×7 operation, or just the time that the application has to be available, if not 24×7. How to go about using the SLAs to pick appropriate technologies is one of the things I'll be going into in the whitepaper (due for publication around the end of September). 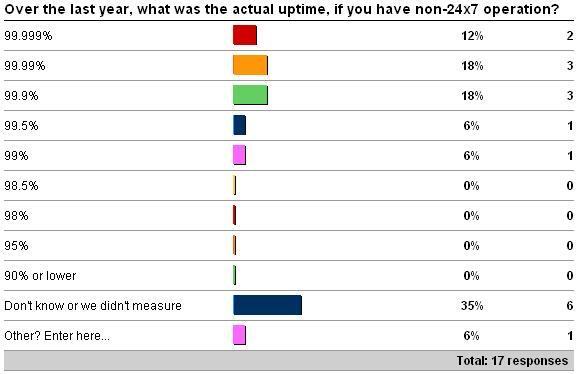 The second questions was what was your measured uptime (again, either for 24×7 operation or not) over the last year. See here for the survey. Here are the results as of 5/30/09. The Other values for 24×7 were 2 x '96', and 1 x 'it varies across customers'. The Other value for non-24×7 was '92'. Of course, this would be a little more meaningful if we could correlate target downtime with actual downtime achieved, but the free survey site doesn't reach that level of sophistication (and I don't think people have enough time to get into that much detail) while casually reading a blog post. Nevertheless, the results are interesting, although not really statistically valid from this small a sample-size. The most interesting data point is that some respondents don't know what they achieved last year, or just didn't measure. I think this is the case for the majority of readers. Having well-defined and appropriate SLAs is the key to defining a workable strategy, and what's the point of defining the SLAs if you don't measure how well you did against them? If you don't meet the target you need to revisit the strategy, the SLAs, or maybe even both. The fact that many people don't have SLAs speaks to the general poor state of high-availability and disaster-recovery planning in the industry, IMHO. And Kimberly just chimed in stating that it also shows how the PC-based server market doesn't focus anywhere near as much on regimented policies and procedures as the older, more traditional, mainframe market did/does. There's a lot of work to be done. Many times this stuff just isn't high up in the priority list until a disaster actually happens. Invariably it then becomes very, very important. Get ahead of the curve and be proactive – one of the things we always tell our clients. Next post – this week's survey!